Representative Ann Wagner’s (R-MO) bill to permanently authorize CDBG-DR has passed through committee with a vote of 53-3. The bill--including several amendments drafted in consultation with NLIHC and DHRC--will now move to the House floor. Congressman Al Green (D-TX) acknowledged the support of these groups (at timestamp 1:13:20). Bills have been introduced in the Senate and House of Representatives to require a study and report on best practices in conducting mortality counts after a major disaster. Senator Kamala Harris (D-CA), author of the Senate bill, stated, “Whether it be Hurricane Maria or another natural disaster to come, the accuracy of the death toll has a direct impact on an area’s recovery.” These bills come in response to a Harvard study that found the death toll to be over 4600, despite the official death count of 64. Four U.S. Senators sent a letter to the secretaries of the Department of Health and Human Services and the Department of Homeland Security requesting a detailed report on each agency’s preparations for the 2018 hurricane season, particularly as it relates to older adults and individuals with disabilities. The letter cites recommendations from the Senate’s Special Committee on Aging, including the prioritization of nursing homes and assisted living facilities for power restoration, greater interagency data exchange, and giving these populations a seat at the table when planning recovery and response efforts. A Vice News analysis found that FEMA has 3,865 workers able to be deployed--about half of the 6,656 workers available a year ago--if a disaster were to strike. The position for FEMA’s second-in-command and three of four associate-administrator posts are vacant or only temporarily filled. The Agency is also without a director of external communications and a head for insurance and mitigation. The 2018 Annual Hurricane Briefing was held at FEMA headquarters on June 6 to reflect on the 2017 hurricane season and to discuss the 2018 season that officially started on June 1. President Trump and First Lady Melania Trump were in attendance, and many governors joined the meeting via video chat. President Trump commended FEMA Administrator Brock Long on his response in Puerto Rico. The Texas General Land Office will use $35.4 million in CDBG-DR funds for a buyout program for homes repeatedly flooded in Harris County, Texas. These funds will be used to acquire up to 160 single-family homes and assist families in moving out of high flood-risk areas. Though Houston was awarded $1 billion in long-term housing aid in response to Hurricane Harvey, there will still be an unmet housing need of over $2.3 billion. This disproportionately harms renters and low-income residents. The New York Times posted a guide explaining discrepancies in the Puerto Rico death count. The government of Puerto Rico has contracted with George Washington University to conduct a more thorough study of the death toll from Hurricane Maria. New York City’s Puerto Rican Day Parade focused on the lack of disaster relief from the U.S. government and the extensive casualties and devastation. Many called for the “decolonization” of Puerto Rico and spoke to the need for more support from the federal government. WG leaders are hosting two meetings this week in Puerto Rico with federal administrative officials, including one with HUD Deputy Secretary Pam Patenaude. They are also having a second meeting with FEMA Office of Chief Counsel attorneys to continue work on two affidavits designed by DHRC leaders to address the challenge of FEMA eligibility determinations for survivors without legal title to their property. Members of this WG with an expertise in social media are meeting to develop a guest-blog strategy for promoting the survivor stories collection tool. 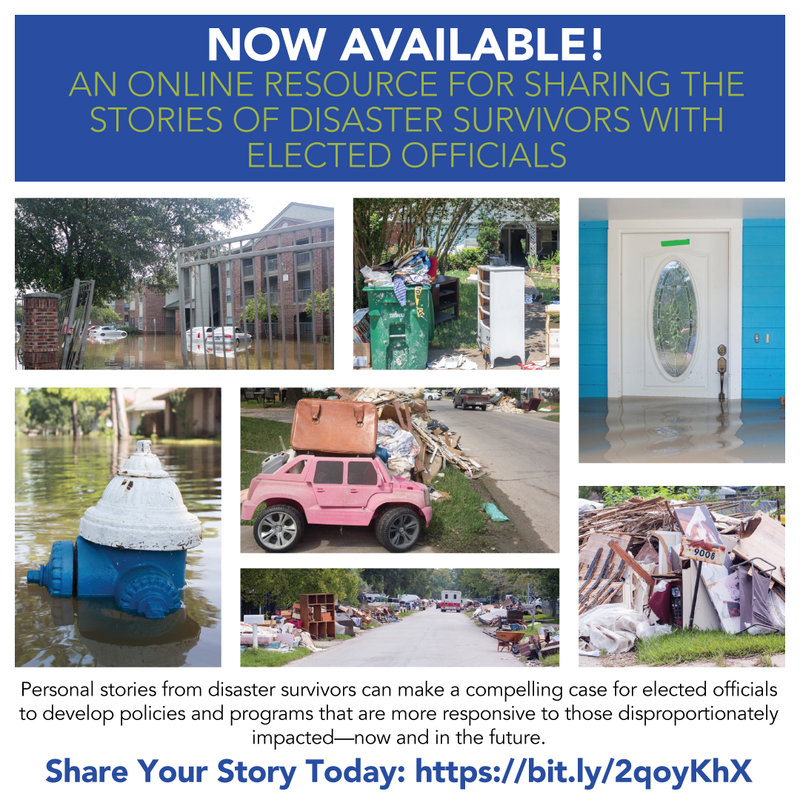 This WG developed a menu of comments from which DHRC organizations could pull and adapt for their respective submissions to FEMA’s Individual Assistance Program and Policy Guide draft by the June 7 deadline. The WG also honed its wish list for a possible FOIA request down to 10 items. The DHRC Policy WG is promoting the NLIHC call to action in support of H.R. 4557, The Reforming Disaster Recovery Act; S. 2996, The Housing Victims of Major Disasters Act; and S. 2880, The Disaster Housing Assistance Act.